Did you ever see the documentary Man On Wire about Philippe Petit, the French artist who walked a wire between the Twin Towers in 1974? (If not, put that on your Netflix cue!) Philippe demonstrated extraordinary balance, determination, and calm. There is a new film opening the New York Film Festival in a few weeks starring the actor Joseph-Gordon Levitt portraying Monsieur Petit, called The Walk. It’s going to be amazing! I was reading an interview by JGL about the film and he told an extraordinary story. For the film, he was trained to walk on a wire by Philippe Petit himself. He set up an eight-day workshop declaring that by the end Joseph would be walking the wire. He balanced on a wire on a sound stage that was 12 feet off the ground. (When I was in Conservatory and in circus skills, the skill I had the most success with was the wire, and ours was only six feet above the ground. Twelve! Eeek!) I can’t even begin to imagine what the real height of 110 stories in 1974 felt like with the naked distance between the towers. Joseph was asked how working with Philippe helped in playing him. Here’s the extraordinary story: In the workshop, Philippe had a Victory Bell. Whenever he would spot a little bit of progress he’d say, “That was a victory! Go ring the bell!” Joseph would run across the room to ring the bell and celebrate his tiny, but mighty victories. At first Joseph felt ridiculous, but the more he did it, the more he became focused on the positives. He realized that positivity was at the core of who Philippe is and how he was able to accomplish such great things. That is extraordinary. A Victory Bell?! Yes! I haven’t been this excited or inspired about something in a very long while. Every home should come equipped with one of these things. Every smart phone should have a Victory Bell app. Every classroom, gymnasium, office work place…where else? I can’t wait to install one in our home so my housemate and I can celebrate our accomplishments. How often do we take the time to acknowledge our own progress? Not enough, I’d imagine. Parents make every effort to high-five their young children as they achieve kid milestones; it’s so encouraging. Even athletes have to complete the whole task before taking a victory lap - winning the race, winning the game. Why not take the lap midway to celebrate your progress? I actually go to a class at my gym where we are constantly high-fiving our neighbor and taking little victory laps all throughout the workout. It’s so important to acknowledge the small milestones on the way to the big finish lines. We take water breaks, bathroom breaks, why not a positive reinforcement break? In grade school it was the absolute greatest feeling when actual gold stars were handed out for a job well done. I would stick them on my forehead or display them on my t-shirt and beam with pride for earning the teacher's recognition. Remember how awesome that felt? At what age do the stars stop being awarded? The Victory Bell is the new gold star! Ding ding ding! And WE decide what gets acknowledged, and we encourage ourselves. There is no need to wait for the high five, the gold star, the applause, a salary raise, whatever it is! Ring your own bell! I was walking through Union Square Farmer’s Market this week and thinking about the interview. Honestly, I’ve thought about it every day, multiple times a day since I read it. Everywhere I looked, I saw produce victories and I rang an imaginary bell in my head as I purchased them. 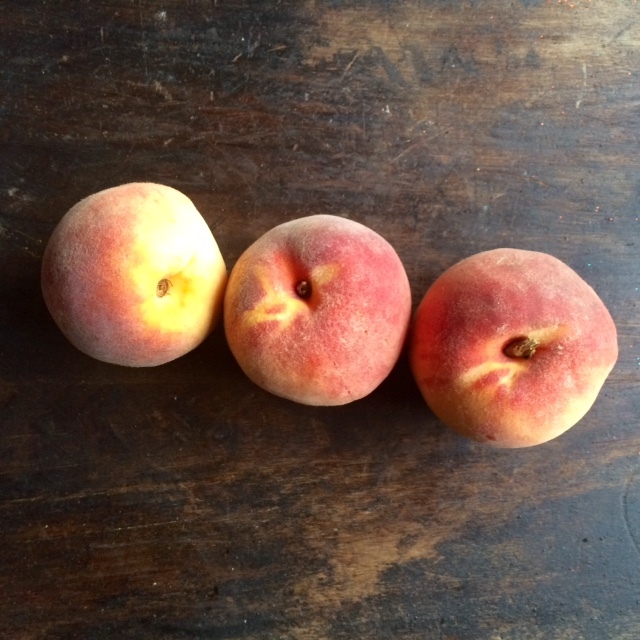 I bought juicy peaches and plums. Ding ding ding! A bouquet of thyme, three huge ears of corn, tiny little wild cherry tomatoes that looked like literal bells on a vine that might tinkle a tune if I gave them a gentle shake. Ding ding ding! 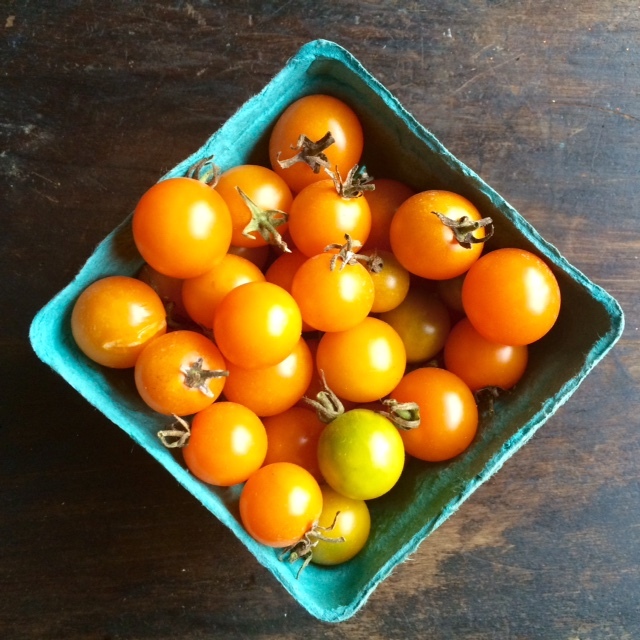 I found the sweethearts of my summer salads, baby yellow sun gold tomatoes. And the one item that has escaped me all summer long (the market normally sells out of them immediately): little Mexican sour gherkin cucumbers! Sometimes they’re called mouse melon cukes because they look like watermelons sized for a mouse. Adorable. A true farmer’s market victory. Ding ding ding! So the REAL question is who wants to be my date for the movie when it opens in New York City on September 26th? I’ll make you a salad…Ding ding ding! Melt the butter in a skillet and sauté the corn until all kernels are coated and it is still a bit crunchy, approximately 5 minutes. Remove from heat and let cool slightly, add remaining ingredients, generously season with salt and pepper, and toss with dressing until everything is well coated.